Located on an off-route from Wayanad near the town of Kalpetta, these falls gush in the form of a steady white stream down on granite rocks below. The falls descend in three tiers. The water later joins the Chaliyar River. The Soochipara Falls is also called Sentinel Rock Waterfalls. It’s a natural wonder for which visitors eagerly walk through the dense terrain of a forest. A gorgeous sight to behold, it also offers outdoorsy visitors the chance to indulge in many activities in its vicinity. These include hiking, swimming, nature walking, rock climbing, and even bathing! These aspects will definitely excite your kids. For added fun, the naturally rocky path is set in a dense forest; so make sure you carry your cameras! 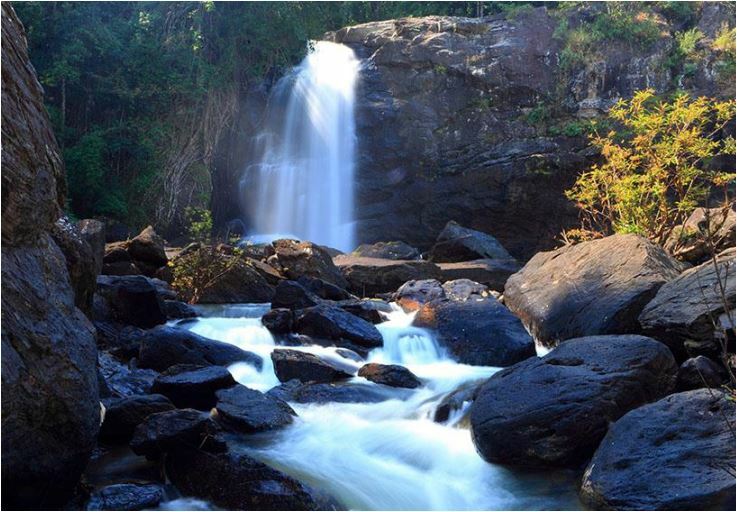 All these factors make Soochipara Falls one of the most popular Wayanad points of interest. Here is some useful information to help you enjoy the best experience that this unique spot has to offer. The closest railway station is at Kozhikode, which is about 71km from Kalpetta. The nearest airport is Calicut International Airport, which is about 65km away. The Soochipara Falls is open from 8 AM to 5 PM. Try going early in the morning to enjoy hiking to the waterfall before the sun comes up. It’s best to visit the waterfall during the monsoon season when its width is almost doubled. Entry to the waterfall is charged at INR 50 per adult. Plastic is not allowed in the vicinity of the falls. All visitors undergo a thorough check before they are allowed entry; so, make sure you avoid carrying any plastic bags to the waterfall. You can enjoy the Soochipara Falls and several other tourist places in Wayanad when holidaying with family; just make sure you check into Vythiri Village Resort, Club Mahindra affiliate resort so that you and the kids are well-rested for a holiday filled with exploration! This Wayanad resort is equipped with modern amenities, comfortable air-conditioned rooms with refrigerators and electric kettles, an in-house restaurant serving delicious local dishes, as well as a plethora of fun indoor and outdoor activities to make sure that your family vacation is just perfect. Read through more positive Club Mahindra reviews by our happy members about how they enjoyed their holidays with family. Get started on filling your holiday scrapbook by creating wonderful memories with Club Mahindra. This entry was posted in Wayanad and tagged kerala waterfalls, soochipara falls wayanad, soochipara travels wayanad, soochipara waterfalls kerala, waterfalls in wayanad. Bookmark the permalink.